Rick’s principal instrument is the bass (acoustic and electric). However, he is also an accomplished guitarist. He finds this combination to be advantageous to his musical instructions. This gives him the ability to accompany his students, both bass and guitar, on either instrument. He has played and has a deep appreciation for all styles of music from Rock to Pop to Jazz. 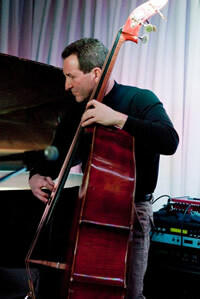 Rick has been an instructor at many collegiate and high school jazz workshops. He has taught bass instruction and coached various jazz ensembles as an adjunct professor at William Peterson University and Passaic County College. He spent over a decade participating in the Generations of Jazz program, sponsored by the New Jersey Jazz Society. This program reached out to elementary through high school students to teach the origins of jazz. His Elementary, Middle and High School students have found success, whether it be from personal enjoyment, participation in a school orchestra, joining a rock, pop or jazz band with peers, all the way to acceptance to college music programs in pursuit to a career in music. His adult students range from beginners, to those who want to rekindle their desire to play again, to professionals. Rick also produces audition CD or DVD’s for college bound seniors. Starting with song selections and ensuring that all the school’s requirements are met, to the actual production in a studio. He can provide top level studio musicians for accompaniment. Many of Rick’s students have been accepted at prestigious universities music programs as Berkeley School of Music, New York University, William Paterson University, Miami University, The LaMonte School of Music at the University of Denver, Montclair State University and Notre Dame University.